Has the question of “Is beer good for health” been haunting you? If yes, then here in answer to the question that often crosses our mind. Beer lovers, you certainly have a reason to rejoice as there are many claims that have been made in the past about the health benefits of beer. For many of the beer lovers – Beer is what heart is to the soul. However, they certainly should also pay heed to the detrimental effects of the same. Beer certainly tastes great and gives one the needed high if had in moderation. Kindly note, this certainly is no invitation for you to get into the habit of drinking beer. How Is Beer Good For Health? Is beer good for health? Here are 5 surprising reasons. Mentioned below are 5 reasons why and how beer is good for health and not “as bad” as you always assumed. Drinking in moderation does not cause any harm. However, if at all you fail to limit the beer consumption, it is certainly not good for you. You might run into unforeseen health issues and might suffer from oesophageal cancer or run into other nasty health conditions. On the other hand, medical research in the past has also proven that not drinking beer at all too does not do you any good either. Beer is good for all till you drink in moderation as the alcohol content in it is quite low compared to other drinks such as wine or spirits. If research stands true, drink beer responsibly as beer drinkers tend to have longer and healthier lives. A Dutch study in the past has proven that beer drinkers never suffer from the deficiency of Vitamin B6 as the beer is loaded with same. Moreover, Vitamin B6 also helps to battle heart diseases. So if you are low in Vitamin B6 and are looking for a healthy dose to boost your health, pick a bottle or max two of a chilled beer and say Cheers to good health! Also, read about: Is Red Wine Good for Health. Beer is not loaded with any additives and preservatives and is as natural as a freshly made orange juice. Beer does not need any extra preservatives for longer shelf life as it has mild alcohol which in itself is a natural preservative. But, how is beer good for health? It is since, beer contains high concentrations of natural antioxidants, which help to protect your heart against various diseases. Therefore, beer is a natural drink that is simply processed, filtered and packaged. So, relax with an all natural beer this evening. 4. Decreases Incidence of Kidney Stones. You still have doubts, is beer good for health? Yes, it certainly is good for you if you are suffering from kidney stones. Studies in the past have proven that there is a considerable 40% decrease in kidney stones among beer drinkers, for the hydration the beer drinker get compared to other alcohol consumption. So now you can bid bye to the immense pain that is often associated with sufferers of kidney stones. So what are you waiting for? Grab a couple of beers and drink in moderation for a stone-free experience throughout life. If you happen to be in a remote area where you fear drinking the local bottled water trust me from now on you will never have a doubt and ask self or anyone is beer good for health? Gulping on the local beer is always a safer bet as the beer is boiled in the brewing process, which is eventually capped and sealed to sell. 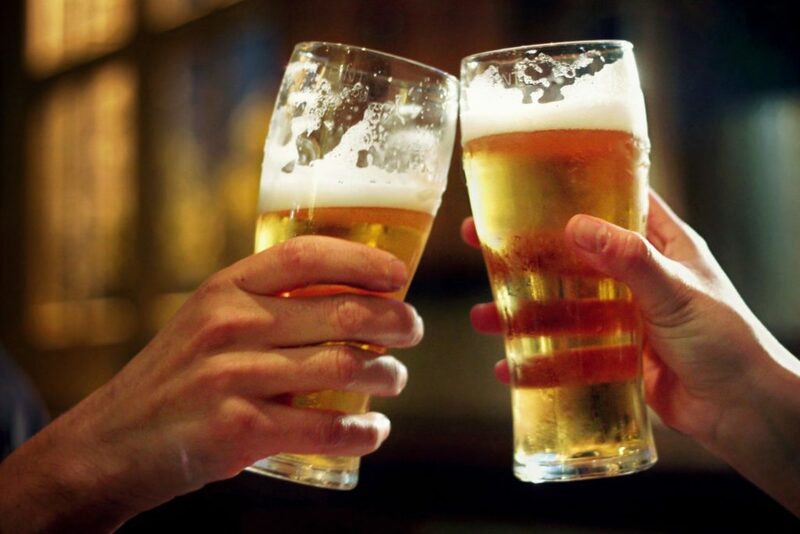 Beer does not contain any life-threatening bacteria (pathogens) that can live in beer. So just enjoy your sealed bottled chill bear anytime anywhere! Also, read about: Keto Diet India & Benefits of Squats for Men & Women. Takeaway – Is beer good for health? Drinking beer not only helps to boost your metabolism, decrease the chances of kidney stones and live a longer – happier life. But, it also helps to keep heart diseases at bay. What more can you ask for? Disclaimer: In this article, we don’t aim to promote any sort of drinking habits in individuals.